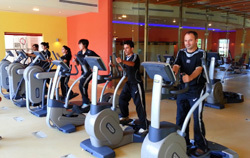 Islamabad Club gym facility comprises of a variety of customized exercise programs, such as individual training programs as well as group classes for members of all age groups, based on their health and fitness levels and lifestyles. Our professional team of trainers will design fitness programs for you to enjoy and recreate your energy. 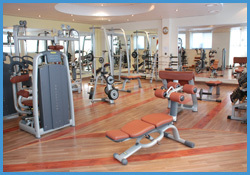 The gym is equipped with a variety of state of the art equipment, which caters to the fitness needs of individuals. The trainers are fully trained to ensure safe and result oriented exercises for our valued members. Our members can enjoy and benefit from the new fitness concepts and innovations as the gym is equipped with world class fitness equipment from Techno Gym Italy. Cardio Zone: Treadmills, Elliptical, Waves, Stationary Bikes, Hand Bike. Mats & Floor Exercises: Includes body stretches on mats and flexibility exercises with qualified trainers. Free weight room is equipped with the most advanced machines and free weights, which meet the requirements of those who would like to exercise with high intensity workouts. The free weight room is equipped with the following machines. Steam Bath: A six seater steam bath to relax the body and unwind the mind.